Deep in the bottom of rivers and swamps is the home to lost treasures known as sinker logs. What makes them so exquisite is their natural beauty that has been preserved in the cool water temperatures with very little oxygen. They have been submerged since the early 1800’s allowing the minerals of the soil to deepen their vibrant color even more. In addition, these logs were over a hundred years old when they sank to the bottom as they were being transported via waterways. Their hardiness and insect resistance has made them a highly sought after commodity in the building industry as well as a mainstay in decorative uses due to their unique variations and character. This is especially evident in the pecky cypress and new and old growth cypress. Retrieving these large logs from the deep water is not an easy task. The procedure takes skill and endurance along with a healthy dose of courage. The job is dangerous and extreme caution must be used to ensure safety. The logs must be located in the dark and murky water where visibility can be as low as zero. Since sight is often minimized, a search by touch is often required. 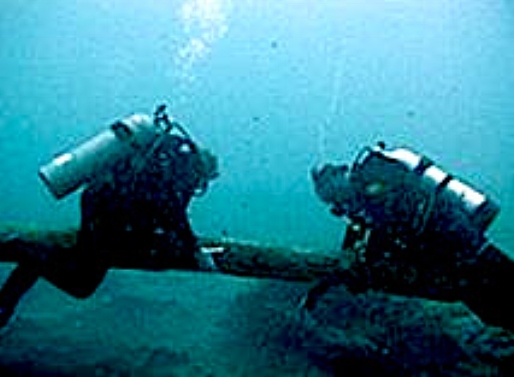 Divers feel their way along the bottom until a log is found and then the process of bringing it to the surface begins by a winch type device and chains or sometimes by brute muscle. In addition to the dangers of bringing an extremely heavy log from the bottom to the surface, there are also the locals aka gators and snakes, that don’t always welcome strangers in their neck of the woods. It’s not a job for the faint of heart! Once the sinker log is retrieved from the water, it is taken to the mill where it is cut to enhance its natural beauty so that it can be shared and appreciated for another hundred years or more. Mossy Head Lumber Company is a family-owned and operated lumber mill that retrieves, mills and sells direct to supplier, builders, and individuals. Visit their slab gallery to see more of nature’s artwork.